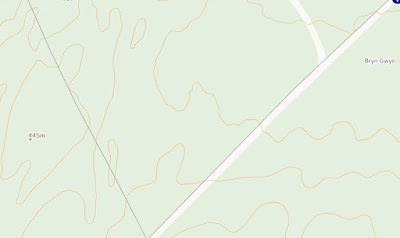 There has been a Summit Relocation to a hill that is listed in the Y Pedwarau, with the summit height, position and relocation confirmed by LIDAR analysis conducted by Aled Williams. Y Pedwarau - Welsh hills at or above 400m and below 500m in height that have 30m minimum drop. 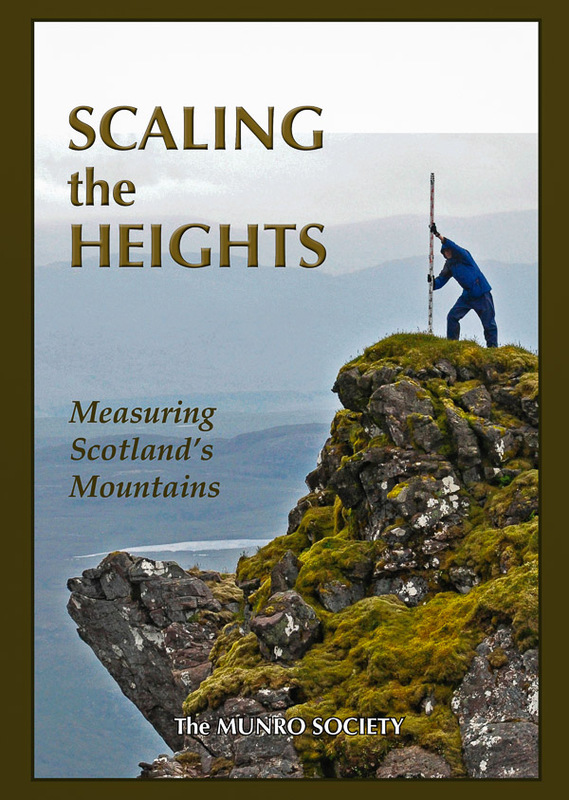 The list is co-authored by Myrddyn Phillips and Aled Williams and the Introduction to the Mapping Mountains publication of this list appeared on the 30th January 2017. 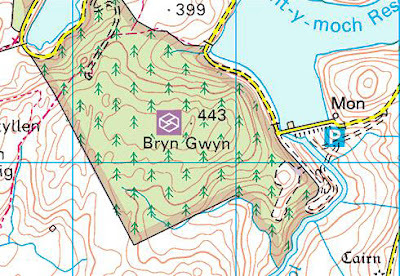 The name of the hill is Bryn Gwyn and it is situated in the Pumlumon range of hills, which are positioned in the north-eastern part of Mid and West Wales (Region B, Sub-Region B2), the upper section of the hill is forested and it is positioned with the Afon Rheidol to its south-east and the Nant y Moch Reservoir to its north, and has the small community of Ponterwyd towards the south. As the summit of the hill is a part of designated open access land it can in theory be approached from a number of directions, however as the upper section of the hill is forested any approach may be problematic. 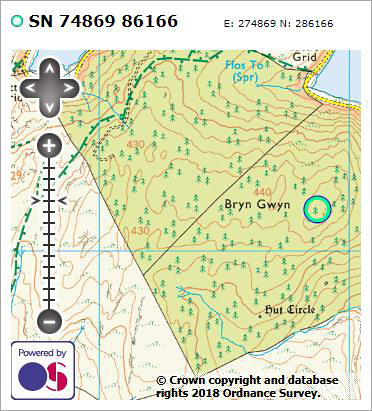 The summit area of this hill has three uppermost 440m contour rings on Ordnance Survey 1:50,000 Landranger and 1:25,000 Explorer maps, with the high point of the westerly contour being free of forestry and the central and easterly contours immersed in it, with the central of these ring contours being given a 443m spot height on the Ordnance Survey 1:50,000 Landranger map, and the westerly ring contour being given a 445m spot height on the Ordnance Survey Interactive Coverage Map hosted on the Geograph website. It was the position of the 445m spot height that was given as the summit of this hill in the 1st edition of Y Pedwarau published by Europeaklist in May 2013. The highest land in each of these contours was analysied via LIDAR by Aled Williams. The LIDAR (Light Detection & Ranging) technique is highly accurate height data that is now freely available for much of England and Wales. The summit height produced by LIDAR analysis is 447.5m and is positioned at SN 74869 86166, this position is not given a spot height on contemporary Ordnance Survey maps. Therefore, the confirmation of the relocated summit position is at SN 74869 86166 and this is approximately 900 metres east from where the previous listed 445m map heighted summit was given in the 1st edition of the Y Pedwarau published by Europeaklist in May 2013.